in 1855 Peace was not signed until 31st March 1856. The Russian fleet had been scuttled in the harbour, and the progress of the siege was marked by its miserable conditions, the armies rife with disease, and acts of gallantry and heroism displayed by both sides. The 28th had gone to the Crimea around 800 strong, all ranks. Only 140 were killed and wounded in the fighting, but 395 died of disease, together with many others whose lives were permanently blighted. On the 8th February Ensign Williams reported to his cousin Sophy that only 50 men remained of the 28th who had set sail from Liverpool. There were over 300 men still with the Colours, but 250 of these were new recruits sent out from England. The French army, which were far better cared for than was the British, assumed the role of the senior partner and the decimated British were reduced to a supporting role. Nevertheless, with Spring, conditions began to improve and the health of the British soldiers started to recover, and the army grew in strength. The first major assault on Sebastopol was launched on 18th June, the 40th Anniversary of the Battle of Waterloo. It was not a propitious date for Anglo-French co-operation, and the attack was badly bungled. The 28th was not as heavily engaged as some, but still suffered some 67 casualties. “The papers will have told you of the failure that the English and French met with on the 18th June in trying to wipe out the recollections of Waterloo. The whole affair was so badly arranged that without any credit to the Russians and with no disgrace to ourselves we got a splendid licking. Nothing more can ensure failure than a divided command. The Generals arranged one plan for attack and at a late hour all was changed and awful confusion was the inevitable consequence. For instance, Eyre was told that 10,000 French would support his Brigade: he rode to the French General late at night to arrange matters, when he learnt that the French General knew of nothing concerning the attack and that he and his troops were on the Tchernaia. Well, for our Brigade, the only one that did anything: we advanced in rapid time, took some houses, held them all day, and retired at evening with the loss of 31 officers and 650 men killed and wounded – Voila tout. The men behaved splendidly. I don’t think we killed 50 Russians in all. For whilst we were exposed they were hid behind parapets. Some Russians tried to turn us out of the houses we took, they were led down the trench to within about 30 yards of us by an Officer, who amused himself by striking his men with the back of his sword, pulling their hair etc. etc. until a shot knocked him over and his men turned and cut. The houses were very nicely furnished, Books, Pianos, Damask Chairs etc. The men made themselves quite at home lounging on Sofa and Chairs, eating the Ration Pork off the Russian Books in lieu of plates. The day before we all went into action all the Minies were changed for the Enfield Rifle, a highly finished Rifle with a small bore and light bullets. Curiously enough on that day the Russians took to firing very large bullets at us for the first time. They seem to have discovered the value of a heavy ball at the time that we with our new light-fangled inventions have discarded them. We have got five wounded officers, one wounded in the right leg is staying in our hut and quite jolly at the idea of getting home. Several times during the day I longed to get a nice little calf wound, and so get done with the Crimea. “Wounds are at a premium, provided that they are not too serious. The 28th is now the strongest Regiment in the Brigade, and as we are very short of Officers, the trench duty is very heavy. The second major assault against Sebastopol was launched on 8th September 1855. The French were successful in achieving their objectives but the British were driven back. Third Division, including the 28th, had remained in reserve, but the 28th had been selected for the storming party due to go in the following day. In the event, this was not required, for overnight, the Russians evacuated the city and abandoned it to the allies. The 28th Regiment left the Crimea on 24th May 1856, bound for Malta. 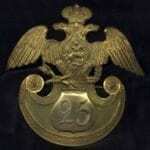 Picture: Russian helmet plate taken at Sebastopol by a soldier of the 28th Regiment. In the Soldiers of Gloucestershire Museum Collection.